Hi! It's Georgina with my regular Thursday post. 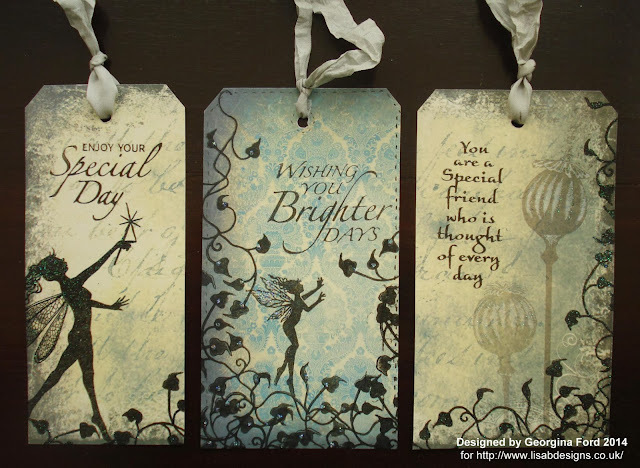 I have some tags to share with you today using stamps and paper from the Lavinia range. The sentiment stamps I have used on the tags are by Hobby Art. Both ranges are available from Lisa B Designs. For my first tag I used the lovely Lavinia Poppy background paper. I cut a tag shaped strip from the paper. I stamped the Fayllin fairy and Weaving ivy images with a Versafine onyx black ink pad. I then heat embossed the images with WOW clear sparkle embossing powder. To finish the tag I stamped the sentiment. The sentiment stamp is from Hobby Art's Sentiments stamp set. For my second tag I used the little Mia fairy and Weaving ivy stamps. The background is Lavinia's Victorian print background paper. 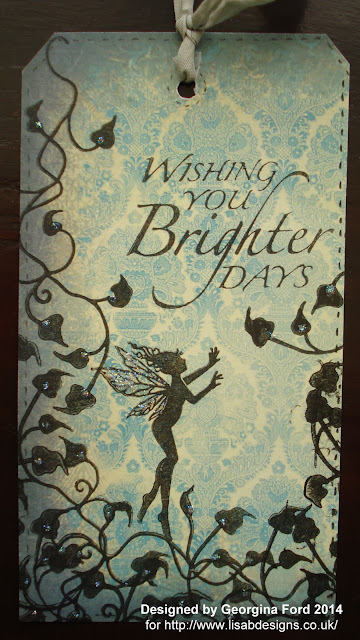 The sentiment stamp is from Hobby Art's Sentiments stamp set. To finish the tag I added faux stitching and Stardust Stickles. For my final tag I used the other piece of Poppy background paper which I had left from my first tag. I stamped the Weaving ivy along the edges and again heat embossed with WOW clear sparkle embossing powder. 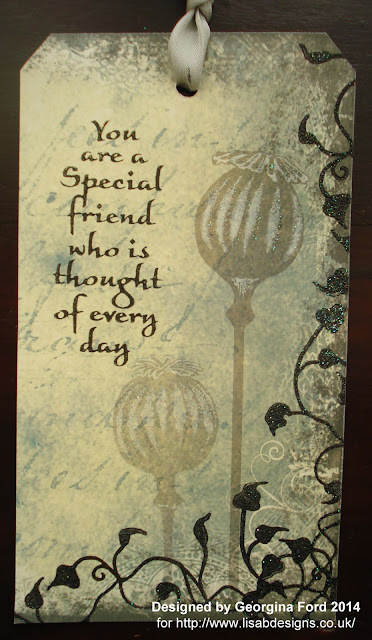 The sentiment is again from Hobby Art's Sentiments stamp set. Thanks for looking & don't forget to leave a comment to be entered in the GIVEAWAY. Beautiful. So effective these stamps and backgriund papers. Cant wait to try these in class. These are all beautiful Georgina, love the beautiful stamps and the gorgeous scenes you have created with them. Everything in this tags are so beautiful. Love both the paper and stamps. I need to bring out my Glitter EP from hibernation, love the look (in small doses!). The papers don't need much to give a beautiful result. Three gorgeous tags. Love the papers which coordinate so well with the stamps. So simple and effective, love it!